Cristina Felix left her position as head coach at Long Beach State on Feb. 1. 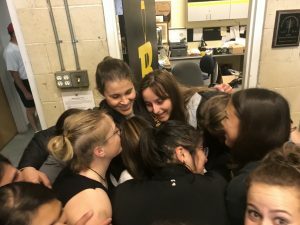 The Pete Archer Rowing Center was filled with teary eyes and group hugs Friday as the Long Beach State Women’s Rowing Crew said farewell to head coach Cristina Felix. After over a decade of contributions to the Long Beach rowing community, Felix will be leaving to pursue a career in pediatric trauma nursing at the Children’s Hospital of Pittsburgh. Felix began her journey with the Long Beach rowing community in 2007 when she rowed for the Long Beach Junior Crew. In her two and a half years rowing with LBJC, Felix won three USRowing Youth National Championships in an 8+, 2x and 4x. After graduating high school in 2008, Felix continued her rowing career in other parts of the country: rowing for the University of Michigan, competing for the United States Under 23 national team and coaching for Skyline High School in Ann Arbor, Michigan. Felix returned to Long Beach, California in 2017 to volunteer for the Long Beach State Women’s Rowing Crew. The following year, sherose as assistant coach and then head coach. According to DeVore, women’s team assistant coach Emily Siersen will be serving as interim women’s head coach until the team finds a replacement. In addition, the women’s team will receive assistance and support from the men’s team coaches as well as Felix who has agreed to provide continuous support for the team remotely. According to DeVore, Felix will be sending workout plans and feedback from Pennsylvania. “I’d like to see the team continue to grow in the same sense that it maintains its focus on developing better people,” Felix said. Felix’s last day as head coach was Friday. Tags: BCA, Crew, Cristina Felix, CSULB, LBJC, lbsu, rowing.